Successfully Added 7inch Headrest TFT-LCD monitor with pillow 16:9 format to your Shopping Cart. 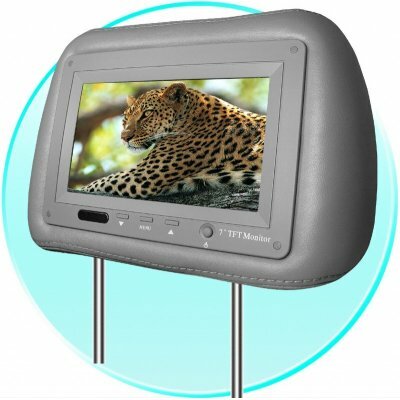 Seven Inch Car DVD/Video monitor built into a high quality headrest for driver or passenger seat. Resolution 234 x 480. Crisp, clear image - this car video display is available to order immediately direct from China in any quantity including samples (please order in pairs). Colours available- gray: Please specify the colour(s) you require using the comments box in the online checkout process.. Important Note about Headrest MonitorsThe headrest monitors already built into the headrest pillows always come in pairs. HOWEVER because of the way our online shop is configured adding one item still means one piece, not one pair.So if you are ordering, you must order a minimum of two pieces (one pair).To put this another way, please make sure the quantity in your online shopping cart is in a multiple of two (i.e. an even number) 2,4,6,8 etc. The monitors are packed two to a box in fully presentable retail packaging with the relevant cables included. The weight calculation is correct in the online system. The weight calculation for shipping costs has been adjusted so that the calculation is based on the weight of 1 piece, even though actually you can't order a single piece, you have to order minimum one pair. E.g. the weight for two pairs is calculated as (1pc)kg x 4pcs. Where colour options are available please specify colours per pair using the online checkout comments box at the time of placing the order. If enquiring about this product please open a support ticket and quote the item code or URL of this web page. car audio and video products inside your car, please consult a specialist in your local area.